THEN the owner Jimmy will commit 100% of profits to improving the environmental sustainability of his business operations. A couple of people from Transition Town Boroondara in Melbourne's East loved the Carrotmob concept and thought they'd give it a shot. 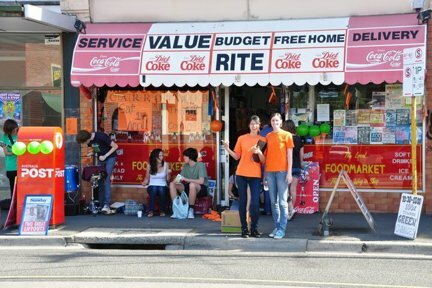 We approached small grocery stores in the local area offering them a free sustainability assessment and the opportunity to compete for Melbourne's first Carrotmob. The sustainability assessments helped three businesses understand the changes they could make and allowed the owners to make a solid pledge/bid for the Carrotmob. We had assistance from the Victorian Employers' Chamber of Commerce (VECCI) who provided the sustainability assessments. It was a beautiful sunny day and what was normally a quiet little local store became a hive of activity - In 3hrs we more than doubled the store's average Saturday revenue. 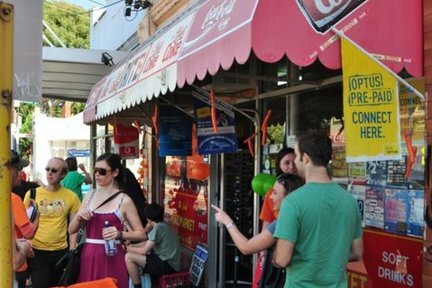 As a result of the Carrotmob the owner replaced all the store's lighting with more energy efficient options, supported a local biscuit provider by selling products during the Carrotmob, and made improvements to his bathroom plumbing to reduce his water usage.